Institute of Management and Entrepreneurship Development (IMED) is offering seats in MBA and MBA HR which are 2-year full time course through B-MAT 2019 followed by GD/PI. 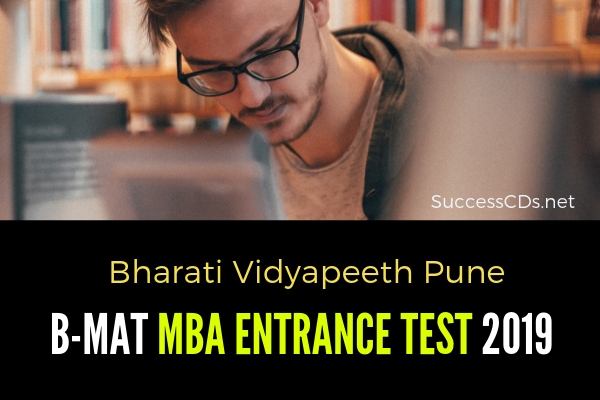 Bharati Vidyapeeth Deemed University, Pune will conduct B-MAT 2019 for admission into MBA Courses for the academic session 2019-20. The Master's in Business Administration (MBA) is a full-time two-year program of 100 - 120 credits with courses speared over 4 semesters. The Program consists of core courses requisite to b business education, open courses that are interdisciplinary in nature and general courses that are focused towards skill development, career development and are value adding. MBA (Gen) and MBA (HR) 2-year full time program with Dual Specialization: Marketing, Finance, HR, IT, IB, Banking and Insurance, Event Retail and Hospitality Management. Ranked 1st in Pune, 3rd in Maharashtra and 46th in India by NIRF, Ministry of Human Resource Development, Govt. of India. Ranked among Top 10-B Schools in India in terms of "Return on Investment" by Business Today. The candidate must be a Graduate with minimum 50% in any subject from a recognized university, 45% marks for SC/ST candidates. Candidates in their final year are also eligible to apply provided they can submit their graduation certificate by August 2019; the candidate should have completed minimum of 15 years of formal education (10+2+3 or 10+2+4 basis). Those whose medium of instruction in Graduation was not English will have to complete an orientation course in English provided by the institutes. A candidate desirous of seeking admission to MBA Program should fulfill the minimum eligibility condition as laid in above. He/she must have appeared for the B-MAT Test conducted by Bharati Vidyapeeth Deemed University, Pune. The candidates shall be selected for admission on the basis of their ranks in the selection list (prepared on the basis of the marks scored in B-MAT Test) and the availability of the seats for the program at the time of counselling and admission. In case of candidates securing equal marks, their relative rank will be determined on the basis of the following order of preference. The entrance test B-MAT for admission to MBA Program consists of in all 250 marks. It consists of (A) Written Test and (B) Group Discussion and Interview. The duration of the B-MAT Test will be for two and half hours. Group Discussion and Interview Test: (i) Performance in Group Discussion (30 questions), (ii) Performance at Interview (20 questions); total 50 questions. The B-MAT 2019 Test will be held at Pune, New Delhi, Navi Mumbai, Karad, Kolhapur, Sangli, Solapur, Lucknow, Chandigarh, Kolkata, Jaipur, Indore and Bhopal. A candidate desirous of appearing for the BMAT-2019 entrance test is required to complete the prescribed online application form and submit to the University along with entrance test fee. The application form is available online at www.bvuniversity.edu.in. Rs.1700 /- + GST 18% Total form fee Rs.2006/- (non-refundable) + applicable payment gateway charges.